I hope you had a good holiday if you celebrate, and if you don’t, I hope you had a good day off with no traffic. And if you happen to live in a place where Christmas isn’t a holiday, I hope you had a good Saturday. In our family, Christmas food is serious business. 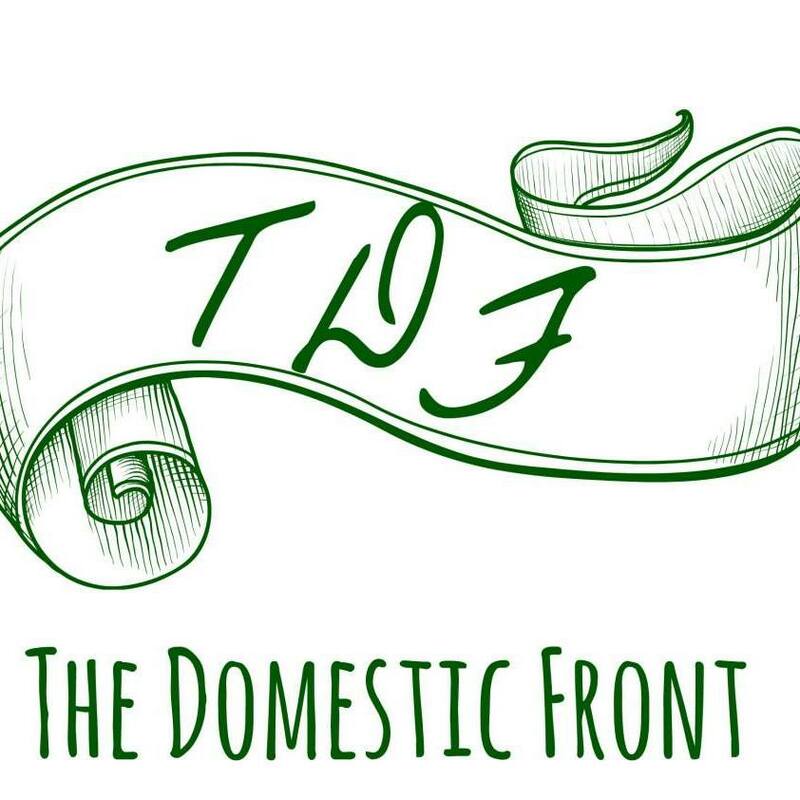 We don’t faff around with the latest trends or even potluck. Christmas day we eat the same thing, prepared by my mother, and have for my entire life – breakfast is pancakes and turkey gravy (think of them as flat biscuits), dinner is prime rib roast, creamed spinach, garlic scalloped potatoes, and figgy pudding (OK, persimmon pudding) with hard sauce. 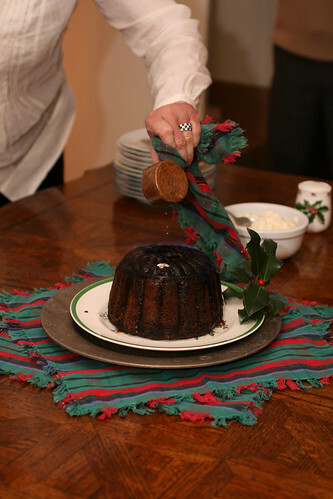 We even flame the pudding in brandy and stand around singing “We all like figgy pudding.” No joke. I told you, we are NOT messing around. Christmas eve is less set in stone. This year, I hosted, and got a little carried away. Hors D’oeuvres, Salad with poached pears and gorgonzola, roast turkey breast with sausage and chestnut stuffing, bread sauce, creamed kale, butternut squash orzotto, and cookies, including peppermint pretzel bark, brandy snaps, cardamom palmiers, and panforte. I think I cooked nine dishes. In other words, I’m wiped. I bet you are too. But it’s time to rally the troops because this weekend is New Year’s Eve. Which means one more night of excess before we launch into the winter of austerity and discipline. And these hors d’oeuvres might be my new favorite form of excess. They are fabulous – buttery and crisp and cheesy. I’ve made them for no fewer than four parties this December. And the best part? They are dead easy to make. 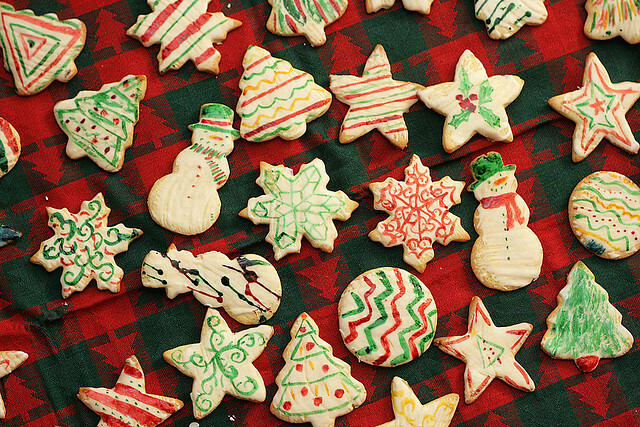 You will literally be able to make these in the same amount of time it takes you to read this blog post — chilling and baking time not included. I’m not THAT verbose. Easy and fabulous is my favorite kind of food. I got the recipe, if you can even call it that, from my genius friend Christine. It goes like this. 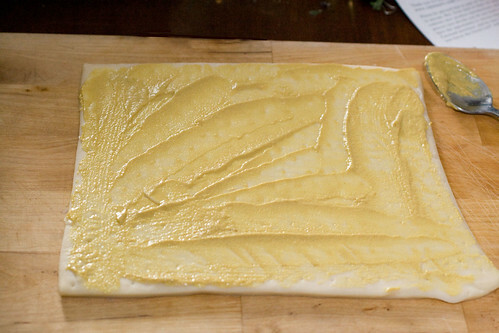 Take a sheet of frozen puff pastry (I use Trader Joe’s, which is made with butter. Pepperidge Farm is vegan. ), let it thaw on the counter for about 10 minutes, then spread it with about 2 teaspoons Dijon mustard. 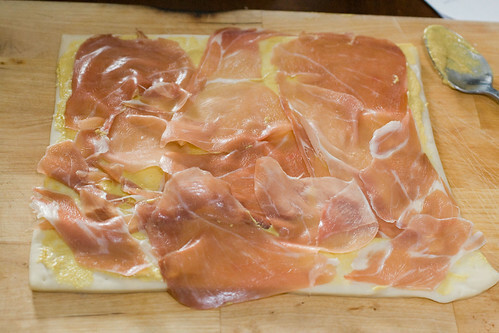 Then take about 2 ounces prosciutto (don’t bust out the La Quercia for this one, the kind from the deli case will do) and arrange it in one layer on the mustard. Then you take about 1 cup of grated gruyere cheese (the ones in the photo are actually made with a bizarre cheddar gruyere blend from Trader Joe’s, but plain gruyere is my favorite), and sprinkle it over the prosciutto. Roll up tightly, then wrap in plastic wrap and pop in the refrigerator for about 15 minutes, or until you’re ready to bake them (If the roll is well wrapped, you can make it a day or two in advance). Preheat your oven to 400 degrees. Slice the roll into slices about 1/2 inch thick, arrange on a cookie sheet, and bake for 12-15 minutes, or until golden brown. See? Wasn’t that a breeze? A good resolution for 2011 – make more food that is easy AND fabulous. 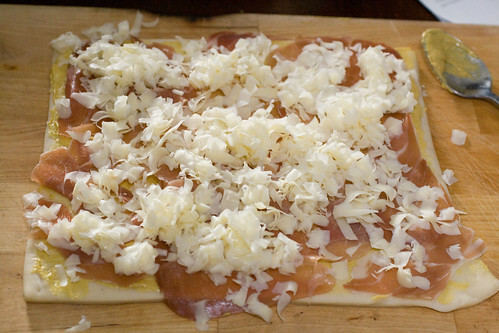 Spread mustard on puff pastry, followed by 1 layer prosciutto, then cheese sprinkled over it all. Roll tightly, wrap in saran wrap, and chill for 15 minutes or until firm, up to a day. 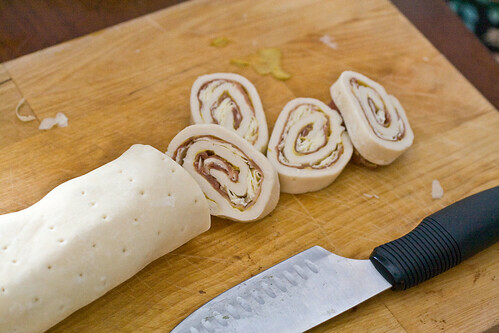 Slice the roll into ½ inch thick slices. 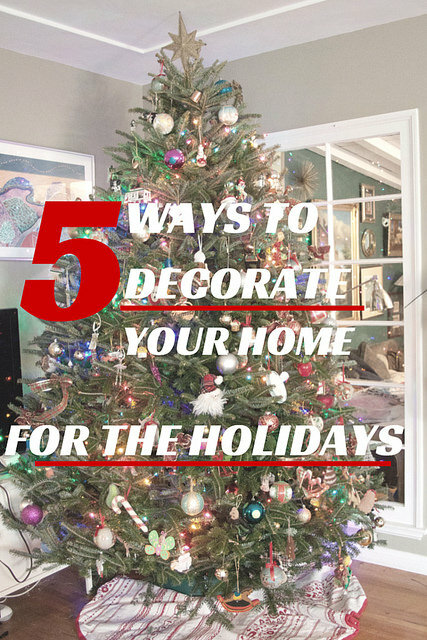 Arrange on a cookie sheet, and bake for 12-15 minutes or until golden. These look scrumptious. 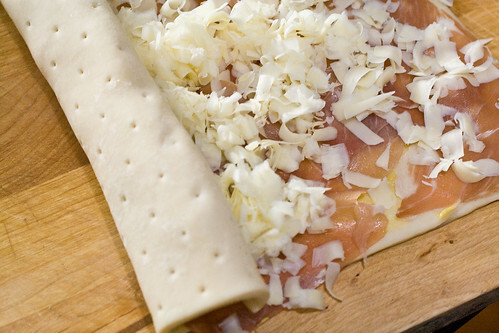 I love anything with puff pastry, I love proscuitto, and i love easy. Sounds like these were made for me. Hooray for easy! Also, you had me at mustard and gruyere…and prosciutto. Happy New Year! These do look easy and fabulous! And, pancakes with turkey gravy? Why did I not think of that? Yum! So glad that you like these as much as I do! Kate – I see in the photo just above the pinwheels after they’ve emerged from the oven, that the roll looks like it’s been pierced/docked. Did you do that before you spread the mustard? The puff pastry I bought came like that! I make pinwheels just like these! except I use parmesan instead of gruyere but I love gruyere so maybe next time I’ll try that instead!! 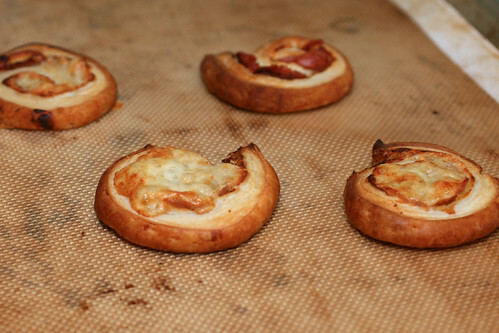 I make pinwheels just like these except I use parmesan instead of gruyere. 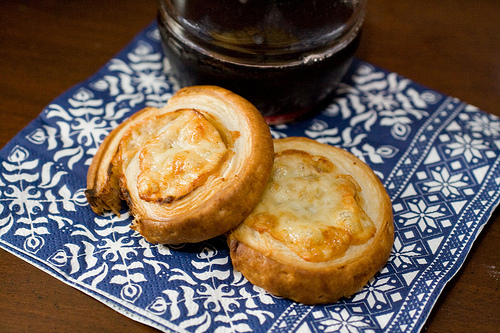 but next time I make them I’ll have to try them with gruyere- one of my fav cheeses!